So who was Alan Lomax? The first person to record Muddy Waters and Woody Guthrie, for starters. His work was a family vocation. Back in 1910, his father, John A. Lomax, published a book of cowboy ballads that John had travelled around and collected on his clunky Ediphone recording device, and that publication did a lot to save songs like “Home on the Range” and “Get Along, Little Dogies” from oblivion. Frankly, it is quite scary to realise how much of the music tradition we now take for granted – in country, blues, gospel, rock’n’roll, etc – has been a fluke of history. What has survived has done so often by chance, and largely thanks to the efforts of a few obsessive folk and blues collectors. They stopped, McTell conceded that his takings as a blind street singer hadn’t been too good that day so…. okay, he’d come back to their hotel room and record a few tunes. That Lomax session in their hotel room for the Library of Congress put McTell back on the radar and – decades later – inspired Jack White, and saw Bob Dylan write one of his best songs about him. McTell, Leadbelly, Bukka White, Skip James, Son House, Muddy Waters, Mississippi Fred McDowell…all were part of a cultural landscape that mainstream America blithely ignored, and that could easily have been lost forever. If it had, the history of rock’n’roll and popular music would have been vastly different. Would there have even been a Jack White, without the miles the Lomaxes clocked during the 1930s, finding and recording the great country blues musicians that White and the rest of us revere today? Probably not. Without the Lomaxes, it is not only the musical landscape of 20th century American music that would be unrecognisable. The same would go for what is known of the musical traditions of Ireland, Spain, Sicily, England, Scotland, Haiti and everywhere else that Alan Lomax set up his microphones. This well-researched biography of Alan Lomax puts that achievement into perspective. Any reader will make their own discoveries. I had no idea before of the key role that Alan Lomax played in the career of Woody Guthrie. Nor that the groundbreaking Miles Davis jazz album Sketches of Spain owed its origins to folk recordings made by Lomax in Spain in the mid 1950s, and forwarded to Miles’ arranger, Gil Evans. 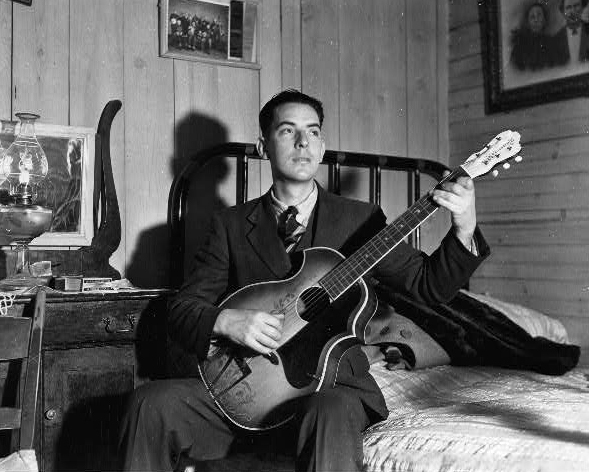 From birth, Alan Lomax seems to have been a sickly kind of child. Yet someone blessed (and cursed) with unbelievable energy, of the sort more commonly found among 19th century Victorian polymaths. At one point, author John A Szwed notes Alan’s legacy when he died in 2002 : it comprised 5,000 hours of sound recordings; 400,000 feet of film; 2,450 videotapes; and a sizeable number of books, journal articles and databases. That’s not counting the innumerable letters and documents that added up to more than 120 linear feet of shelf space. And its also not counting the vast array of folklore projects, recording missions, and film and television proposals that Lomax kept on planning, writing out and promoting – and which, for wont of money or a lack of vision by his sponsors, never got made. The man’s mental and physical energy fairly leaps off the page. Read this book and you’ll never complain about your own crowded schedule and workaholic tendencies ever again. And always it seems, there were the long list of female companions who came along with Lomax on his trips into the wild unknown – to Haiti in the 1940s , to rural Spain, Sicily and Ireland in the 1950s – and to help him set up the recording gear, and dance with the locals. They also helped Lomax with the basic task of approaching total strangers, and asking them to share their songs. Folklore and its analysis was a job to which Lomax brought a unique mixture of blazing energy and at times, stupefying pedantry. Easy to see why some in Ireland complained that he’d roared through the country like Attila the Hun, and ridden roughshod over the sensibilities of other folk music collectors. He got the job done, though. Many of the lasting images I carried away from this book came from the early years with Alan’s father. 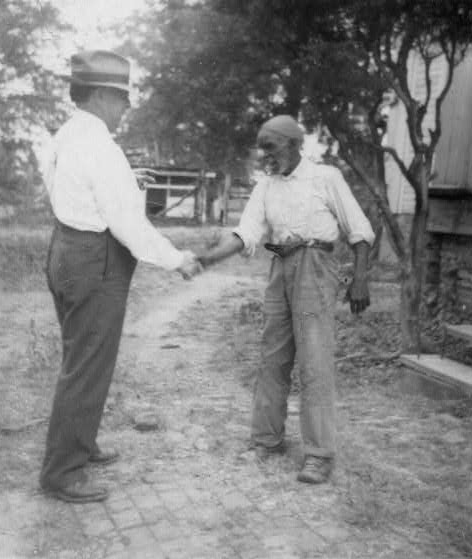 John A. Lomax had been the trailblazer. He began doing folklore work well before Alan finally accepted that this was his own true vocation, too. It proved a very strange way of working out one’s paternal demons. Father and son were both intensely competitive individuals. They would drive the back roads of the South together in the 1930s – accosting people on the porches of general stores, visiting congregations in clapboard churches, and wooing suspicious prison superintendents into letting them set up their primitive recording gear in hellholes like Angola and Parchman Farm, to record convicts both individually, and in work gangs. The entire time, the two men were jammed in their small car in the middle of nowhere arguing from their fiercely opposed political viewpoints about the social causes and wider meaning of the great music they were saving from extinction. John Lomax died in 1947. 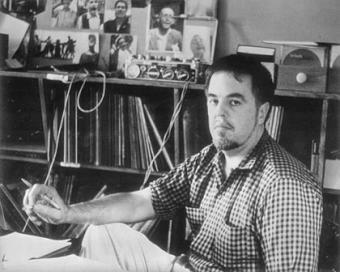 With the advent of McCarthyism and the communist witch hunts, Alan Lomax left America behind for a while. The FBI had repeatedly interviewed him and kept him under surveillance ( he consorted after all, with blacks and poor people) and the Bureau eventually amassed an 800 page file on him. For most of the 1950s, Lomax lived in London, and worked at the BBC. 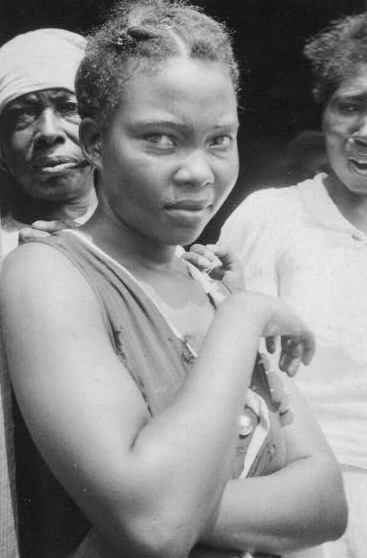 Baptist women, False Rivere, Lousiana, 1934 (Lomax Collection). My own favourite story about the Lomaxes is not even mentioned in this book. But if you ever happen to listen to Blind Willie McTell’s 1940 Library of Congress session, there’s a point where you can hear John Lomax query McTell about the whereabouts of McTell’s former musical partner, the great gospel singer Blind Willie Johnson. He’s dead, McTell tells Lomax, citing a letter he’d received from Johnson’s former wife. In fact, this wasn’t true. Johnson died in utter poverty five years later, of malarial fever caught from sleeping under some wet newspapers amid the ruins of his burned out home in Beaumont, Texas. Was McTell honestly mistaken – or lying? Think about it. Out of the blue on this very same day, he’d just been blessed with the patronage of these two weird white people who must have seemed like meal tickets sent from heaven. That is, until they’d started asking the whereabouts of an even greater blind musician. The temptation to put them off the trail would have been nigh on irresistible. One can only speculate about what might have been. 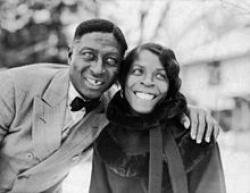 If the Lomaxes had pressed on with their search for Johnson, they might have saved one of the greatest figures in American music from obscurity and a premature death – just as they’d discovered Leadbelly in prison in 1934, and helped him find an audience. So yes, we do have that crucial meeting in Atlanta to thank for McTell’s legacy – but the price may have been losing what could have been with Blind Willie Johnson. Szwed has two other excellent musical biographies under his belt, on Sun Ra and Miles Davis. This book begins by tracing how the Lomax family got into folklore, and turned it into a profession. The early sections of the book contain useful background context on fore-runners like Cecil Sharp and Francis Child, whose book of collected ballads is another essential strand in the Appalachian folk tradition. Huddie and Martha Ledbetter, 1935. The Lomaxes story is not without controversy. For decades, people have slammed Alan Lomax for making money out of folk lore. At the time of his death I got involved in an online fight with someone on the Counter Punch website who had used Alan’s death in 2002 to resurrect the old leftist canard about the alleged exploitation of Huddie Ledbetter (Leadbelly) , which – in reality – was very much a two way affair, if it was exploitation at all. After he was paroled, Leadbelly did work as a driver on a few of the Lomax field trips, and did sing and play to illustrate some of their lectures, and later became the subject of a book written by John Lomax. When President Reagan awarded him the National Medal of the Arts on July 4, 1986. Alan was surely the financially poorest recipient of that honour ; his tax return for the previous year showed that his adjusted gross income was $11, 531. Fields Ward, Bog Trotters Band, Galax Virginia, 1937, (Lomax Collection). 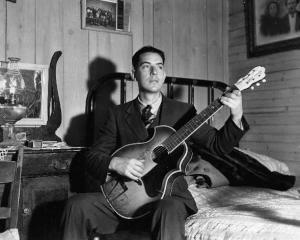 For someone with an unjustified reputation as a purist snob, Alan Lomax was in fact, very positive about rock’n’roll. Szwed’s book lays to rest the folk legend that he – or Pete Seeger, or both – had angrily tried to cut the electricity cable during the famous set when Bob Dylan went electric at the Newport Folk Festival. He did however have a roll on the ground fight at Newport with Dylan’s manager Albert Grossman, after Grossman objected to the disdainful introduction Lomax had given to another one of Grossman’s clients, the Paul Butterfield Blues Band. If you do get ahold of Szwed’s book – and I hope its clear that I’m strongly recommending that you do – read it in conjunction with what Dylan says about Lomax in his own Chronicles autobiography. It fills out the picture, somewhat. . 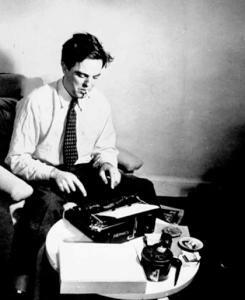 Ultimately, Alan Lomax was a highly strung, exuberant, at times annoying figure who changed the face of American popular music by being – nerds of the world, unite – a committed fan and advocate. Not only of folk music, but of the people who made it. Lomax’s contribution will endure in more ways than one. When NASA launched Voyager 1 and II in the 1970s, the spacecraft contained samples of music created by humans, for the edification of any intergalactic aliens who might come across them in future. Lomax himself ended up by choosing about half of the contents : which helps to explain why Blind Willie Johnson, Louis Armstrong and Chuck Berry sit there alongside Bach, Stravinsky, Beethoven and Bartok, plus folk music from Peru, the Solomon Islands, Japan, Mexico and Java. Long after life on earth has ceased to exist, these selections from Lomax’s jukebox will probably still be tootling their way through deep space, looking for an audience. There was a cold frenzy in the way I worked. In the field, collecting, I was never satisfied with what I had found that day – no singer could ever make me feel that I had gone far enough. No schedule of driving and interviewing and recording, begun no matter how early and continued no matter how late, was enough to make me feel satisfied with the day’s work. In the office at the Library, the same thing was true. It seemed to me impossible to quit at the end of the day. When I did get home, I slunk home, with a mountain of worries and anxieties about things undone on my shoulders. This cloud of anxiety hung so darkly over everything I did, that the work itself suffered. In the field, no matter how hard I tried, I could never keep a systematic notebook. In the office I could never seem to get around to cataloguing or classifying the songs. So behind me year by year, there accumulated an ever-growing black mountain of unfinished and unorganised work…so when, at CBS they called me a folklore expert, and even today when here at Decca they refer to me as the foremost authority on American folksongs, I get an inward feeling of nausea, due to guilt, and what else? The personal and artistic contradictions that explain such spasms of self-doubt were genuine, and rooted not only in his paternal rivalry, but in the nature of his work. Szwed is right when he concludes that Lomax’s influence can still be seen in the distortions of the funhouse mirror of American culture, where a hard-fought idea can be perverted through the countervailing forces of social and technological interests, and the discourses of fashion. Pandora.com for instance, is one reasonably close approximation of Lomax’s vision of a Global Jukebox that could codify and disseminate folk music of all traditions, worldwide. Even as I was writing this review, I came across this link that suggests that – on what would have been Alan Lomax’s 97th birthday – the Global Jukebox may, at last, be finally becoming a reality.